Doctor Who: Big Finish - THE FEAST OF AXOS | Warped Factor - Words in the Key of Geek. Feast Of Axos is blessed with one of Big Finish's more intriguing TARDIS crews. Leading the cast is Colin Baker, not only playing the Sixth Doctor but also a second role in the form of an Axon duplicate of the Doctor. The results are particularly unnerving at times, such as in the scenes leading up to the story’s finale. Baker also shares fine chemistry with his two companions, Maggie Stables as Evelyn Smythe and John Pickard as Thomas Brewster. This is, perhaps, not a surprise in the case of Stables’ Evelyn since she has been a longtime Sixth Doctor companion, but it is in the case of Pickard’s Brewster, who had only previously appeared in the Fifth Doctor audios. Even more important is the fact that the script gives them all something to do, which can be a problem with multiple companions. In a way, the companions steal the show from the Doctor, whether it be the antagonism between the Doctor and Brewster throughout, or Evelyn’s highly emotional cliffhanger at the end of part three. The single element that ties Feast to its television predecessor The Claws of Axos is the presence of actor Bernard Holley. Holley was the lead Axon as well as the voice of Axos in the original, and he reprises those roles here. He honestly sounds like a day hasn’t passed in forty years, and his performance is just as unsettling here as it was in the original, especially in the cliffhangers for parts one and two. It also helps that the story makes strong use of many of the original sound effects used in Claws, which go a long way to bringing a stronger sense of authenticity to this as a proper sequel. The result is that the Axons, who were by their very nature a visual monster, have a strong audio presence as well, and Holley is superb in this respect. Story-wise Feast could easily have been another alien invasion story, or simply a remake of the original 1971 adventure, but it is far from that. In fact, Mike Maddox’s script turns the entire notion on its head. Axos isn’t invading Earth, Earth is invading Axos. A space mission has been financed by billionaire Campbell Irons with the intention of docking and penetrating Axos, with the goal of making it a deal: a strip of planet Earth every so often, in return for solving the energy problems of a world whose resources are becoming scarcer. The upshot is a wonderful combination of past, present and future: references to the space defense station from the Classic Series story The Android Invasion and the British Rocket Group of the Quatermass serials; the space tourism business that is beginning to take shape in our present; and the potentially bleak future referenced in the Ongoing Series episode The Waters of Mars. Add on some fantastic cliffhangers, intriguing time paradox elements and a decidedly grim feel to the entire story as well, and the result is a strong all-around narrative. 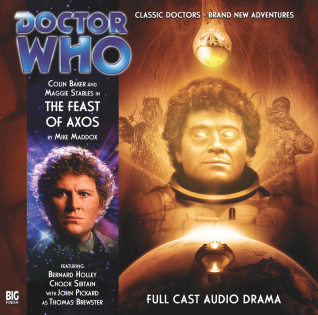 The Feast of Axos, as a Doctor Who adventure story, works well. 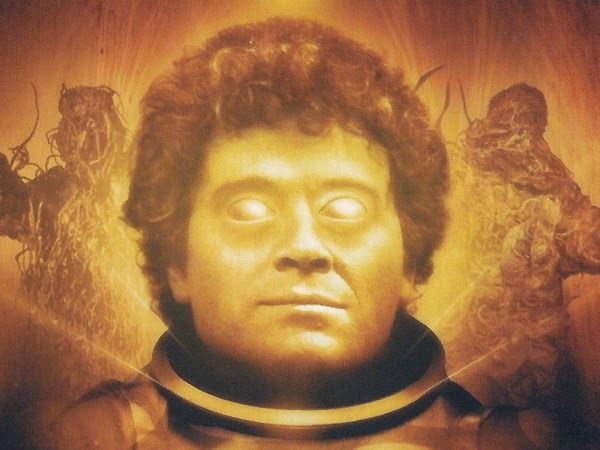 This is thanks to a well-used TARDIS crew, the return of a classic monster/villain and a script that inverts the original story to which it is a sequel. The outcome is a satisfying mixing of past and present all in one place.